Natural or homeopathic remedies are a popular option for pets. They tend to cost less than prescription medications from the veterinarian. Dandelion root has medicinal qualities for all pets, including dogs. 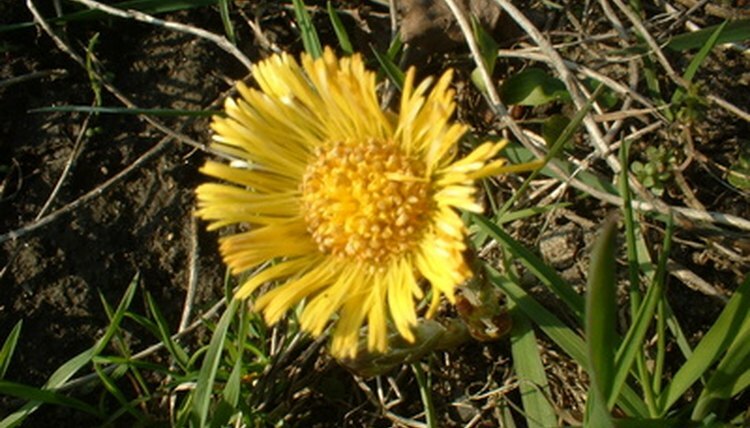 Pet owners can buy the root as medicine from homeopathic or nature-based pet stores, or buy a tincture in which dandelion root is one of the ingredients. Dandelion root (Taraxacum officinale) is a natural diuretic and stimulates bile production. This makes it ideal for dogs who are suffering from stomach problems which an increase in stomach acid (not a decrease!) can help treat. Seek the advice of your vet if you are not sure if your dog is constipated or suffering from increased stomach acid. The dandelion roots should be shredded and mixed with the dog's food. If the dog refuses to eat the dandelion root, try shredding it into smaller pieces, but treatment may not be possible. Wash and clean the roots thoroughly before giving them to any pet. Since dandelion root stimulate bile production, it also helps circulation in the liver, where bile is produced and spreads in the digestive system. Pet owners who have dogs that are suffer from liver problems can use dandelion root to help the liver function. This will not solve any pre-existing liver conditions, but it can be a useful supplement in addition to other medications designed to help heal the liver. Owners can feed dogs the root in the same ways for digestion purposes. Dandelion root is also mixed in a tincture with licorice root and cat's claw for some skin treatments. The tincture is meant to be a largely fluid solution used to stimulate skin cells, reduce inflammation and take care of minor irritation problems like skin redness, itching or swelling. Owners often use these tinctures when their dogs are suffering from sensitive skin due to fleas or mange. It should be rubbed past the hair and into the skin as needed. Dandelion root is generally safe, but it can reduce blood sugar levels in dogs that are given a large amount of the root to eat. This can be dangerous to dogs already on medication or with pre-existing blood sugar conditions. If the dog is already taking drugs to lower blood sugar, dandelion root should be avoided. The entire dandelion plant can be shredded and mixed in with dog food for extra benefits. The plant as a whole is rich in nutrients and minerals such as potassium. Its natural diuretic qualities will also be enhanced, making it ideal for treating kidney inflammation, which can be relieved by cleansing the kidneys more frequently, or bladder infections. Talk to your vet before giving dandelion root to your do. Ask about its benefits and possible side effects. Take your dog to the vet and pursue other methods of treatment if the dandelion does not seem to be effective.